Welcome to Paintball Gypsy Cobs lovingly cared for by Jacquie Bland in Kentmere, Staveley, The Lake District, UK. Nestled in the lakeland hills is the 15th centry farmstead of Low Fold and grazing on the herb rich fells that suround Lowfold are the Gypsy Cobs of the Paintball stud. Proud and regal the resident stallion Cassius is the Lord of all he surveys with stunning views of the Kentmere and Longsleddale Valleys. Gypsy Cobs are good all round equines. The Gypsy Cob temperament is unique. They have been carefully and selectively bred for many generations specifically for their calm and gentle nature, as well as their intelligence, versatility, hardiness, and beauty! 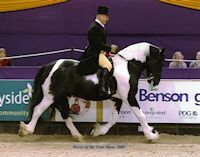 for sale a few beautiful well bred cobs. Low Fold is a hill farm. 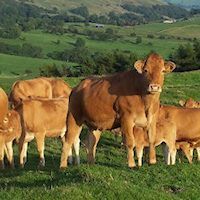 We run pedigree limousin cattle and rough fell sheep alongside the Cobs. Both Cobs and cattle are bred for their temperament, 'No good having the best looking animal if it's no fun to own'. A young stallion with movement and temperament. He has the wow factor!! Now in the Show Ring and in winning form.